Being May 12, there are just ten days left until our football season is over. Two games left to play and we need to gain at least four points to be certain of third spot. Manchester City who are riding our tails play Stoke (H) and Bolton (A) and you would expect them to pick up maximum points from both games. Which means we need a moral boosting victory over Aston Villa on Sunday. The early team news is that Cesc Fabregas should be fit to play after missing our last two games with a thigh injury. Henri Lansbury returned to the club this week being on loan at Norwich for the season - helping them achieve automatic promotion. He's eligible for the remaining fixtures and it would be nice to see him given a cameo ahead of next season. Another player I'd like to see given some minutes is Thomas Vermaelen. 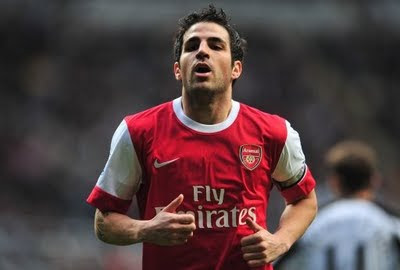 I've seen him in an Arsenal tracksuit at the Britannia on Sunday, but I would like to see if he can actually play again. Hopefully with a summer off, he'll be fighting fit and ready to play at the start of next season. We really have missed him this term, especially his goals. Players given roles in our defence this season have scored ten goals. The Belgium international scored eight in all competitions last term. An area in my opinion where we've missed goals is from the bench. This term players coming on as substitutes have scored just three. I wondered if that's the lowest in the league. Obviously the players Wenger brings on could alter the game and set up the goal rather than score it, but it surprised me to find that out, certainly considering all the attacking options the Frenchman fills the bench with. Perhaps that's something the manager will look at for next season. Perhaps that player might be Malaga forward Salomon Rondon who we have been scouting according to Sky Sports. The 21-year-old has scored 14 goals in 29 appearances this season and would command a fee of up to £18m. Another player we've been linked with is Pepe Reina. Bob Wilson revealed we made a substantial offer for the Spain bench warmer last summer and according to the Daily Mail, he might be available if Liverpool moved for Aston Villa's Brad Friedel who is out of contract this summer. We'll certainly be looking at goalkeepers this summer. Wojciech Szczesny and Lukasz Fabianski will battle it out for the number one spot but as this season has proved, they'll certainly need back up. Personally I don't see us buying an established goalkeeper to fight for the number one spot. I think we need someone who can make the spot competitive and has experience but won't cost the money Reina would to buy. Plus it would be nice if he had experience of the Premier League. With my belief we need competition for Alex Song in the squad, how about us signing a 27-year-old who has played at the highest levels of the game? We've again been linked with Felipe Melo who hasn't had the best of times in his two seasons at Juventus following his £21m move from Fiorentina. Of course we were in for him at the time for that move but Arsene Wenger was never going to stretch to the asking price of the Brazilian. The Daily Mail spoke to his agent and he says the midfielder could be available this summer. I think he's got lots of the attributes we're looking for in a player: he's experienced, gives everything, a winner and has plenty of character. Plus he's a bit mental. He picked up 17 yellow cards and three red in his first season. I think he could certainly do a job for us. And finally reports in Germany suggest Bayern Munich are interested in signing Bacary Sagna. Personally I can't see us letting go one of our most integral members of the defence.